Knit By God's Hand: Go RED! 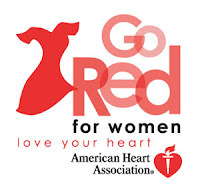 You got your red on today ladies???? I've got mine on! It still amazes me how heart disease is the number one killer of women.... scary! Thanks for the reminder. Now... I gotta go find a red shirt... I know there is one in the closet somewhere!!!! Thank you for reminding all of us about this. Doesn't it actually go through the whole month of February on Fridays? How is your heart doing friend? Thanks for the reminder! Haven't gotten dressed yet so I'll be sure to put on some red for the ladies! Wrong day for me to wear grey. What a drab color anyway! Thanks! I do and I have the little red dress pin too!